Black nonglare coated steel shaft. 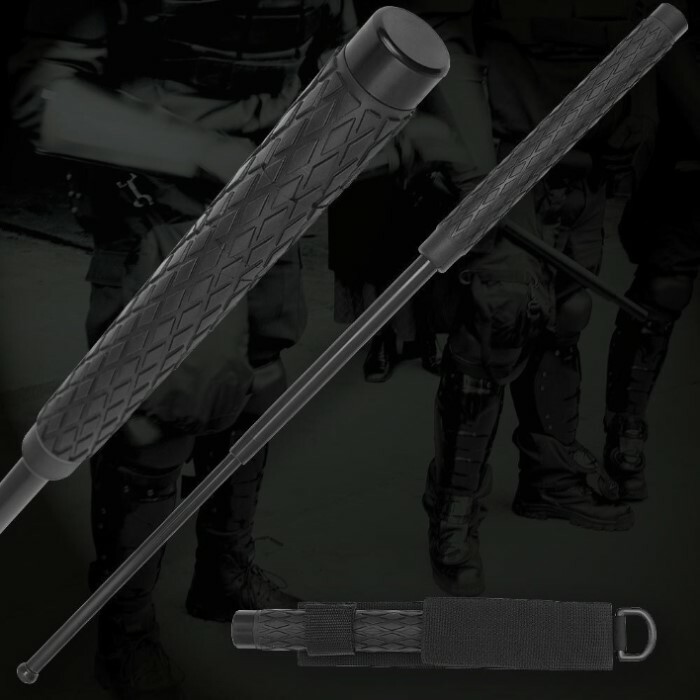 Rubber handle with diamond grip. Includes nylon pouch. 26" overall. Very sturdy. Fun to play with. Just make sure to close it correctly or the lock will break and the whole baton will either be broken or just weaker then before. pretty solid and obviously capable of serious damage. The end piece of metal bends real east so watch out for that. Difficult to retract, I've taken to punching it down of pavement or a stone to get it down. Seems really solid. It can be a bit difficult to push it back in but besides that it's great. Beautiful!! stable and solidly built. carrier is well sown and fits perfect on my belt. WELL MADE BUT ( TUFF ) TO COLLAPSE. Super fast delivery! Great baton. Functions exactly as advertised. Super grip and plenty of striking power.